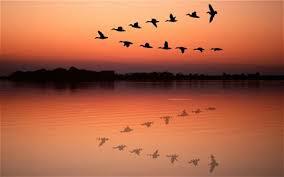 Have you ever noticed birds flying in sky ? Interestingly, they follow a pattern which resembles the letter 'V'. This is to reduce the resistance offered by air. The first bird in the formation works the hardest by being the first to break through the air. Actually the lead bird creates a trail of air turbulence that helps lift along the V-direction, thus making the flight of the other birds a bit easier. This is similar to a boat moving in the water leaving behind waves in 'V' shape. And if you watch a V-formation carefully, you'll notice that the lead bird does not stay in that position for very long but will drop back into the formation, while another, not-as-tired bird takes the lead, breaking through the air first. That is what co-ordination means !